Retired Admiral Dawson, PVSM, AVSM, (Retd), of the Indian Navy is doing some research on the War Graves, Commonwealth Cemeteries, War Memorials in Bangalore and also in India. He is doing an independent study, and has also submitted some of his research on St. John's Cemetery at Kalpally, to the " British Association for Cemeteries in South Asia " (BACSA). This Page is put up in honour of his great work. Admiral OS Dawson was featured on Star News (NDTV) on 14th December 1998 regarding the Old Protestant Cemetery or Agram Cemetery. 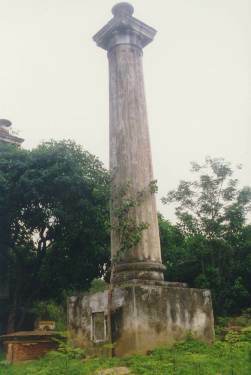 The Cemeteries in Bangalore (Hindu, Muslim and Christian) existed on land which had been donated by the Maharajas of Old Mysore. Certain lands adjoining Tippu Sultans' fortress at Srirangapatnam were also made available as cemeteries in which British Officers, NCOs and men were buried. In India two cemeteries at Kohima-Palel and Delhi are maintained at International standards, but they get a substantial fund from the War Graves Commission. David Bernard of the British Association Cemeteries South Asia, visited Bangalore in 1994 to check out on the possibility of the Military Graves in Bangalore being maintained. Priority on the lists of Cemetery Maintenance is the Old Cemetery at Agram, which dates back to 1808. The Old Protestant Cemetery (Photographs) or the Agram Cemetery is in close proximity to, and a little to the west of, the Agram Barracks; today, the location is slightly different in landmarks, to the East there is the ASC Officers Mess, To the South, the Records Office, To the North there are Quarters of both the Military and the Reserve Police, to the West there is the Reserve Police Parade Grounds. There is only one gate to this Cemetery that is located between the Records Office and the Parade Ground, and it is always shut. IN this Cemetery, the tombs of many good and great men, Soldiers, Wives, Children, Pastors, long since passed away, are to be seen here. The Cemetery in the first decade of 1900 was open on Thursdays and Sundays to the public, from sunrise. There were several graves dating as far back as 1808 and contained interesting cenotaphs and epitaphs. This Cemetery has also figured in the Believe It or Not. It was said that one of the soldiers buried there was executed because he did not drink his pint of rum! The Cemetery was disused from around 1870, and was abandoned after the 1920's. (There was a separate Cemetery for the Roman Catholics, which was situated on Richmond Road, in the compound of the Church of the Sacred Heart. These graves have been unfortunately cleared for a Parking Spot, and there is also no record as to who was buried there, even the grave stones were broken into pieces. There is only one grave that has been preserved, because the owner appeared to the Bishop and Parish Priest and got the tomb excavated, people believe that the body of a young girl was found intact and fresh. She is buried in the Priest's Cemetery in the same compound in an enclosed area. This account is true, and details can be found under the life of Rev. Fr. Antoine Mary Tabard )!!. "Beneath a Tomb close to this pillar rest the Mortal Remains of Lieut. John Pott, H.M. 13th Dragoons, who died 31st January 1822 Aged 25 years. The Tomb and this Memorial of their loss is erected by his sorrowing brother officers." Lieut. Wm. Brown, 4th October, 1822, aged 24 years, all of H.M. 13th Dragoons. Major Edward Gillespie Taylor of the same Regiment, who died on the 26th November, 1836, aged 47 years. Sergeant-Major Kelly, of H.M. 59th Regiment of Foot, which dates back to 1808. Capt. Robert Beauchamp, of the Horse Artillery, who died on the 29th May, 1813, aged 26 years. Gunner James Rayan, of the C. Troop, Horse Artillery, and Bombardier James Carroll, of the same Corps, who were accidently killed by the upsetting of a gun at the review of the Horse Artillery, before Major-Gen. Allan, C.B., on the 4th December, 1840. Lieut. George Bullanshaw, of the Rifle Corps who died in the field while serving with Brigade-General Munro's Army on 23rd May, 1818, is also buried here. Jane Peach Rice, w/o Benjamin Rice of the London Mission died 11/3/1864 57 yrs. The above names were found on a paper which stated that they were stones to be removed from the Agram Cemetery, Bangalore, India and are within the period 1805 to 1870. Data on other Cemeteries may be available, are the St. John's Cemetery at Kalpally, and the Roman Catholic and Protestant Cemeteries at Hosur Road. Again one has to mention the great and Herculean efforts of Admiral Dawson in trying to restore this Cemetery. There are lots of Grave Stones used as a dividing wall between the Cemetery and the Reserve Police. Some of the graves date back to 1808!!. There are so many architecture styles used in the construction of the tombs and one really wonders as to the origin. Undertakers or Sculptors (as there were known in those days) like S. Mullenex and Nelson & Black built most of the graves. Very large granite slabs and blocks were used for the graves, even these heavy blocks and slabs have been moved to make the fencing, and some just moved around, perhaps to be carried away. To restore the Cemetery into the original beauty would take quite a lot of finance, as a lot of the masonry has been reduced to rubble and also by removing the stones that protected the graves, exposed it to the elements. Admiral Dawson, the Reserve Police and the ASC have not given up and as well as a few of us who have volunteered to try and restore the cemetery. There is too much of History in this Cemetery to lose like the other old Cemeteries of Bangalore!! Any advice or help in locating data on this Cemetery would be appreciated. We are on the look out for the Plan of the Cemetery as it is not available anywhere in Bangalore. You may write to Admiral O.S. Dawson, PVSM, AVSM, (Retd. ), IN, 32 Viviani Road, Bangalore 560 005, Phone: 91 80 5471653 or send an e-mail message to ronniejohnson@vsnl.net !! Mark Howells - Someone who gave us the first lead to a link on Agram Cemetery on the Net!! A Site for Genealogy Links!